Cold, dreary Sunday at the end of December beckons for wood crackling in the fireplace, a good book or old movie to cuddle up to, and my take on chicken pot pie - check out this relatively easy recipe that will have your home filled with BOTH literal and metaphoric warmth. Rub chicken thighs with olive oil and salt and pepper; heat butter in medium sized cast iron skillet, then sear and cook thighs until golden brown. Remove thighs, allow to cool, then cut into medium sized dice. In a small sauce pan, warm chicken stock. In the same cast iron skillet, add butter, once melted add onions and cook until translucent De-glaze with white wine, and reduce to half volume; then add flour and cook until onions are completely covered. 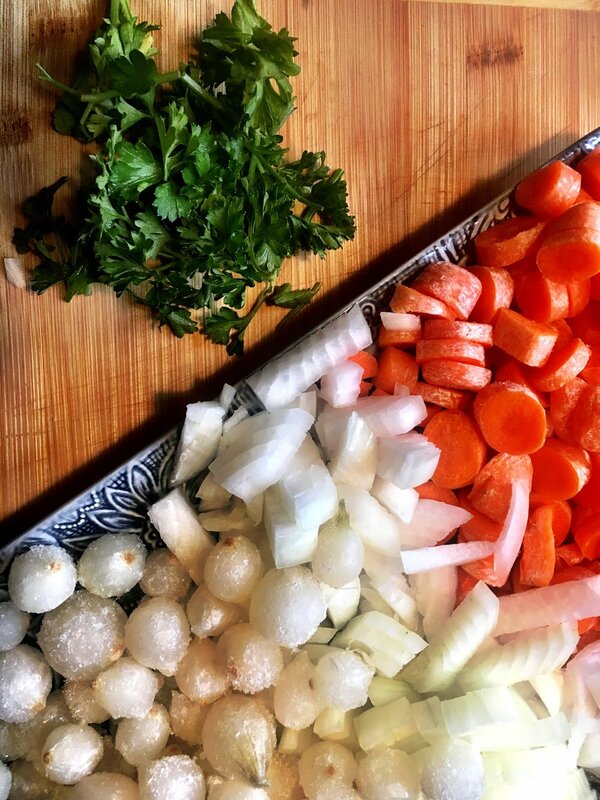 Next add warm chicken stock, and while simmering incorporate salt, pepper, garlic, and heavy cream; allow to simmer for a couple minutes then gently add chicken, peas, carrots, frozen onions, rosemary and parsley. Allow mixture to rest. For the crust, mix flour, salt, baking powder, and baking soda in the bowl of your Kitchen-aide or food processor - add shortening and butter to flour mixture, and work with your hands until well incorporated. Using paddle or blade attachment, add ice cold water until dough forms. Remove and knead dough ball until round, shiny. Flatten, then allow to chill in fridge for about 15 minutes - longer if you can wait; I couldn’t wait. Roll into round sheet that is just wide enough to cover skillet with filling, probably 1 to 1 1/2 inch thick - mix egg with cream, then brush atop dough until fully covered. Top with salt and pepper, then bake in 375 degree oven for about 45 minutes, or until golden brown.